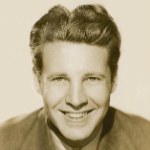 Ozzie Nelson (March 20, 1906 – June 3, 1975) was an American band leader, actor, director, and producer. He originated and starred in The Adventures of Ozzie and Harriet, a radio and long-running television series with his wife Harriet and two sons David and Ricky Nelson. Nelson started his entertainment career as a band leader. He formed and led the Ozzie Nelson Band. Nelson’s records were consistently popular and in 1934 Nelson enjoyed success with his hit song, “Over Somebody Else’s Shoulder” which he introduced. Nelson was their primary vocalist and (from August 1932) featured in duets with his other star vocalist, Harriet Hilliard. Nelson’s calm, easy vocal style was popular on records and radio and quite similar to son Rick’s voice, and Harriet’s perky vocals added to the band’s popularity. In 1935, Ozzie Nelson and His Orchestra had a number one hit with “And Then Some”, which was number one for one week on the U.S. pop singles chart. In October 1935 he married the band’s vocalist Hilliard. The couple had two children. David (1936–2011), became an actor and director. Ricky (1940–1985), became an actor and singer.